Is There True Safety in Using Restraints on Elders? Home > Nursing home > Is There True Safety in Using Restraints on Elders? While I was still in nursing school and working part-time as an aide in a major city hospital on the Oncology Floor, one day my assignment included an elderly woman, “Agnes”, with lung cancer and dementia. She had just been admitted the night before. During AM report, I was told that she was as “thin as a rail” as the saying goes. She was strong both physically and in determination. She kept getting out of bed and falling, thankfully without any injury. So the night shift nurse had raised all four side rails and applied a restraining vest to keep her safely in bed. My charge nurse and I made rounds together to view our assignment. When we entered Agnes’ room, we were horrified to find her head and neck jammed between the two half rails on one side of the bed. The vest was bunched up around her throat. She was not breathing and her eyes were bulging from the sockets. Agnes had lung cancer and dementia, but she died unnecessarily and prematurely. She was strangled well before either of her illnesses would have taken her. Unfortunately, Agnes’ case is not isolated. In 1999, an estimated 200 deaths occurred due to suffocation or strangulation from restraints (Guttman et al, 1999). Public awareness of the potential danger arising from the use of physical restraints has increased since the Omnibus Budget Reconciliation Act (OBRA) of 1987. It proclaimed, “residents have the right to be free from…any physical or chemical restraint imposed for purposes of discipline or convenience and not required to treat the resident’s medical symptoms” (HCFA, 42 CFR 483.13(a)). Vest restraints and side rails are only two among many types of restraint being used in hospitals and nursing homes today. 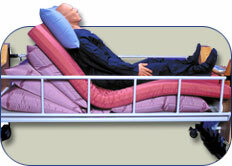 A definition of a restraint is “any physical, chemical, or mechanical means which prevents or impairs a patient/resident’s ability to stand, turn, or walk or denies them access to any part of their body.” So, we must also include tucking in a sheet so tightly as to prevent movement, using a removable Velcro belt on someone in a wheelchair/Geri chair to prevent rising, placing a wheelchair/bed flush to the wall on one side to prevent the person from rising, and even one-quarter side rails are a potential source of fracture, bruise and skin tear. Restraints are not to be considered a long-term solution to a perceived problem. Restraints have been used for cognitive impairment with disruptive behavior, older age, wandering, history of falls, to protect placement of a treatment device, and for the protection of other residents. They absolutely may not be used because a nurse or aide does not want to keep answering a personal alarm because the resident is attempting to move, or because the employee does not want to make frequent checks on the patient/resident. Facilities across the country are making a concerted effort to eliminate/reduce their use of restraints of any kind. Concerned family members may think that tying the elderly down will protect against falls. Capezutti (2002) noted that adding bilateral side rails did not reduce or eliminate falls, with or without injury. A resident who is not restrained has dignity, a greater independence in toileting, hygiene, feeding, mobility and the ability to attend more social activities and gatherings. Facility staff should address the complex needs of residents individually through a multi-disciplinary quality improvement approach. Then, restraint use would become the rarity. “The goals of individualized care include promoting comfort and safe mobility, optimizing function and independence, and achieving the greatest possible dignity and quality of life. Such care requires clinicians to make sense of behavior rather than to control responses of clients.” (Strumpf et al, 1998). Reducing the number of any type of restraints in a facility complies with federal regulations and also marks an improvement for the facility, the staff and the residents and their families. Med League provides a long term care nursing expert. Call us today for the assistant. Capezuti E., Evans L., Strumpf NE, Maislin G, Physical Restraint Use and Bed-Related Fall Outcomes Among Nursing Home Residents. Journal of the American Geriatrics Society 2002: 50(1):90-96. Guttman R., Altman RD, Karlan MS. Report of the Council on Scientific Affairs, Use of Restraints for Patients in Nursing Homes. Council on Scientific Affairs, American Medical Association, Archives of Family Medicine 1999; 8(2): 101-5. Strumpf NE, Eapezuti E., Evans LK, Grisso JA, Maislin G/. The Relationship Between Physical Restraint Removal and Falls and Injuries Among Nursing Home Residents. Journal of Gerontology: Medical Science. 1998a; 53A(1):M47-M52.